Trapper Ron Baker has over 15 years of wildlife control experience, stories and advice for you to enjoy. He has handled every thing from mice, squirrels, skunks, ground hogs, raccoons, birds, bees, muskrats, coyote, and opossum. 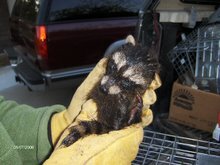 Trapper Ron is licensed by the Michigan Department of Natural Resources as a Wildlife Nuisance Animal Control Operator. LC# RC613. Many of our clients say that they wished they called Trapper Ron first. Wolves In the Northern Lower Peninsula ? When more wolves draw near, how will we react? GRAYLING, Mich. — Our oldest son, Cam, is 32, yet he vividly remembers a night when he was 10 and sleeping in a tent near a lake in Ontario, where a bush plane had dropped us off for a week of fishing.We had flown in with Craig Porter, now the Detroit Free Press deputy photo editor, and the late Lee Day, our copy desk chief, and we would amuse ourselves at night by calling to the packs of gray wolves we could hear howling in the hills around us, some of them many miles away. When the wolves answered, I could feel Cam snuggle closer and shiver as he listened to their indescribably wild songs.One night, just as we were dropping off to sleep, I heard him whisper urgently, "Dad! Dad! They're here!" Half-groggy, I didn't understand what he meant at first. But as I looked through the tent flap, I saw something moving in the faint light from the stars and the dying fire and realized it was two wolves, which apparently had run into our camp by accident.They were skittish, and we could see the firelight reflected in their eyes as they swung their heads around trying to figure out what the heck this strange-smelling place was.They must have seen some movement in the tent because both animals suddenly spun on their hind legs and were gone in a flash, so close we could hear their toenails skittering on the rocks. We saw them for only five seconds, yet those seconds are among the clearest memories I carry from a life spent in the outdoors.That night came to mind recently when the state Department of Natural Resources confirmed the presence of at least three wolves in the northern Lower Peninsula. The DNR also said it hasn't been able to get signals from another 20 or so wolves fitted with radio collars in the Upper Peninsula.A radio-collared wolf was killed near Rogers City by a trapper who said he thought it was an unusually large coyote. Then a Presque Isle County resident asked the DNR to look at some unusual tracks on his property, and a biologist confirmed they were wolf tracks.The DNR thinks some of the wolves whose radio collars can't be detected might have crossed the ice at the Straits of Mackinac to the Lower Peninsula.While the confirmation of wolves in the Lower Peninsula has thrilled wolf lovers, it will stir equally strong emotions among wolf haters. Michiganders will have to face this question: How many of these beautiful but controversial animals are we prepared to put up with, compared to the number the habitat can sustain?I occasionally hear hunters in the Upper Peninsula complain that wolves are responsible for drastic reductions in deer numbers. That's ridiculous. The DNR estimates the UP wolf population at about 360. Even if it were double that number, and every wolf ate a deer a week (a high estimate), wolves in the UP would still kill only a fraction of the deer taken by hunters or that starve each winter. I would bet cars kill more deer in the UP than wolves do.The public's reaction will be interesting when the wolves begin knocking off livestock and pets like dogs, which they will do if they get the chance. Remember, while they look like dogs, gray wolves are just as wild as any other predator and a lot smarter than most.About 20 years ago, we had a small summer cabin on Vancouver Island in British Columbia, and one year we arrived to find that a lot of people had new dogs. At first I thought we must be seeing the work of the world's greatest puppy salesman, but when I asked a neighbor, she answered, "Oh, it's the wolves." It turned out that the wolves live mostly in the mountainous interior of the island, but in the rare, severe winter, they come down from the hills and go through neighborhoods snatching up dogs.That shouldn't prove to be a big problem in Michigan. We have tough winters, but there are so many deer, the wolves can survive nicely on them. But I wonder what will happen if the wolves in one pack figure out they can make a much easier living by hanging out near a town and eating those four-legged offerings the nice people put out for them?I also can guarantee that some Lower Peninsula hunters will begin screaming that wolves are eating all of their deer.It's a lot easier to blame wolves than to admit that we created a deer herd way too large for the environment. And we raised deer hunters' expectations to unrealistic levels when they had unusually high success rates. [Excerpts:] - Deer are a deadly and costly driving hazard on Wisconsin highways. Last year there were more than 45,000 deer/auto collisions in Wisconsin resulting in six deaths, more than 600 injured and $100-million in property damage. Many of these accidents occur in November. Deer/auto collisions also cost the auto insurance industry about $2,000 per claim, according to the Wisconsin Insurance Alliance (WIA). [End excerpts.]Interesting. Speaking of deer...A motorist struck a "Sitka deer" on U.S.-2 in Quinnesec, Michigan, this week (a short drive from my northern Wisconsin home). Native to Europe, Sitka deer are also stocked at game farms that cater to hunters. The Michigan Department of Natural Resources (DNR) believes the animal is a possible "escapee" from just such a farm. I searched for the following article after the girl at the BP station in Norway, MI, told me she witnessed the accident and called all her friends to tell them she "saw a car hit a moose!" Trapper Ron Baker has over 15 years of wildlife control experience, stories and advice for you to enjoy. He has handled every thing from mice, squirrels, skunks, ground hogs, raccoons, birds, bees, muskrats, coyote, and opossum. Trapper Ron is licensed by the Michigan Department of Natural Resources as a Wildlife Nuisance Animal Control Operator. LC# RC613. Many of our clients say that they wished they called Trapper Ron first ! If I cannot Help This New Blog Contains Every One Of My Competitors. Use this list to compare services and pricing. Trapper Ron Baker has over 15 years of wildlife control experience, stories and advice for you to enjoy. He has handled every thing from mice, squirrels, skunks, ground hogs, raccoons, birds, bees, muskrats, coyote, and opossum.